MontCo’s Scott Kelleher is an undefeated pro boxer with two wins under his belt already this year and another bout coming up this month. Scott Kelleher played freshman football for Abington High School, and was hoping to move up the ranks to the JV and varsity. But, he needed to build up his body. A tight end and defensive end, he was having trouble putting on enough weight, and spent part of the off-season learning to box. Soon, he was hooked. 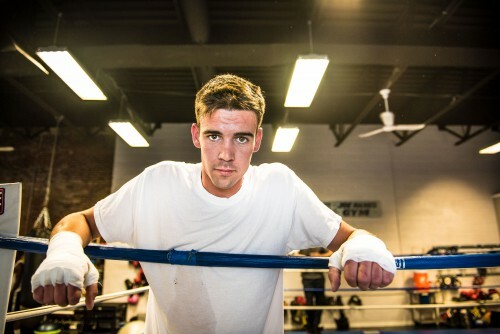 Today, Scott “Irish Thunder” Kelleher is 22 and a professional boxer. Six feet tall and 140 pounds, the junior welterweight is 2-0 with one knockout. After his second win in October, he’ll be back in the ring on Nov. 20 to face Kevin Garcia. Kelleher describes himself as a blue-collar guy who likes to hang out with his friends. He chose his nickname in honor of “Irish” Micky Ward and Arturo “Thunder” Gatti, who engaged in a classic trilogy of fights. He has an Irish cross tattoo on his upper arm, and he enters the ring to I’m Shipping Up to Boston by the American Celtic punk band Dropkick Murphys. And, like his chosen namesakes, Kelleher likes to put on a good show. “I like to think I’m a fan-friendly fighter,” he said. Kelleher lived in Rockledge most of his life, moving from Northeast Philadelphia when he was a toddler. Growing up, he played baseball and basketball, but mostly enjoyed playing pound football for Fox-Rok Athletic Association.He fought his first amatuer bout at 15, knocking out his opponent in 34 seconds. He KO’d his next three opponents. One memorable fight came outdoors at the Lawncrest 4th of July Celebration in Northeast Philly. “It was a hundred degrees,” Kelleher recalled. In all, he fought about 35 times as an amateur, in venues from Scranton to Salisbury, Maryland. He lost about seven or eight, though was never knocked out. He won a state Golden Gloves title and a Junior Olympics championship. Kelleher started out training at the Jack Costello Boxing Club in Northeast Philly before moving to the Young Guns Boxing Club in Germantown. 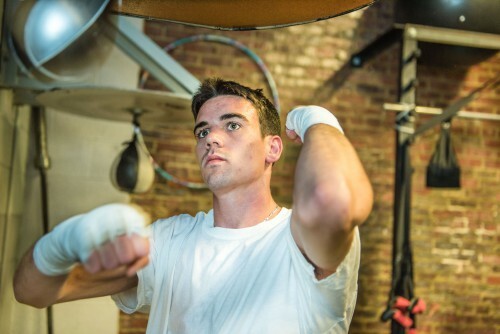 Now, he travels from Rockledge to the Northern Liberties section of the city to train at Joe Hand Boxing Gym. His trainers, brothers Wade and assistant trainer Randy Hinnant, said he’s got what it takes, both physically and mentally. And while the young Kelleher may lack experience, he’s a good listener, said Wade, “mentally tough and a student of the game.” Those factors go a long way for the boxer, on both sides of the rope. “It’s important to believe your corner,” Randy said. Kelleher said he ditched the headgear and turned pro only after Wade pronounced him ready to go. He used to be a brawler, but now uses his long reach to mix in some jabs. His first pro fight came on Aug. 15 at The Playground in Atlantic City, where he knocked out Xzaviar Ford in 1:57 in the first round of a scheduled four-rounder. Kelleher returned to the ring on Oct. 2, earning a four-round decision over Alberto Manukyan at the 2300 Arena in South Philadelphia. He won by 40-35 scores on all three judges’ scorecards. Next month, he’ll be back at the 2300 Arena for the bout with Garcia. He’s gaining confidence. “I’ve got a lot to work on, but I listen to Wade well. I think it’s going to be something special,” he said. His dad listens, too. Bill Kelleher, Scott’s father and manager, trained his son early in his career. He’s proud that his son is rising from humble beginnings, he said, but also believes it best for dads to take a step back. He’s placed his faith in Wade and Randy, noting that his son and trainer Wade have a trust and rapport similar to movie icons Rocky Balboa and his trainer, Mickey, according to Bill Kelleher. “It’s a dangerous sport. I’m putting my son’s well-being in Wade’s hands,” he said. “She’s my biggest fan and my biggest critic,” he said. With his team and family behind him, Kelleher works hard every day, in and out of the ring. After graduating from Abington Senior High School in 2012, he studied electrical at a trade school for a year. Now, he’s an apprentice for International Brotherhood of Electrical Workers Local 98. He spends a day a week in a classroom at Local 98’s school at 17th and Spring Garden streets and works four days a week at MJK Electric, based in Berlin, New Jersey. He did some work related to the recent visit by Pope Francis. 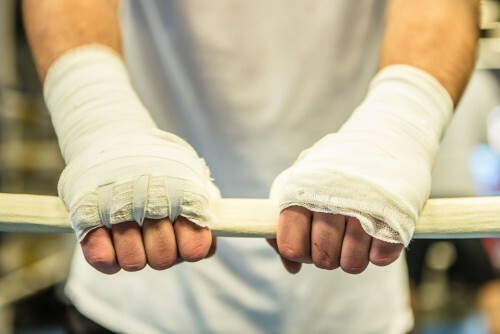 Then, after work he heads to the Joe Hand Boxing Gym, where he spars, jumps rope, does pushups and situps, uses the heavy bag and speed bag and does mitt work. The fighter also runs a lot, usually in Pennypack Park in Northeast Philly, adjacent to Montgomery County.